SPINFUEL: Welcome Immortal Fog to the pages of Spinfuel. We’ve been looking forward to talking to you. Would you like to introduce yourselves to our readers? Immortal Fog was developed by the flavor lab at ecigExpress, which is the largest DIY e-liquid company in the United States. We decided to launch Immortal Fog because we wanted to use our six years of flavor expertise to produce complex yet timeless recipes. SPINFUEL: Who, or what, inspired you to get into the e-juice business? When was that? Like countless others, I struggled with a smoking addiction. I had little success with various smoking cessation aids, and some of the side effects were terrible, including severe depression and suicidal thoughts. Vaping saved my life. 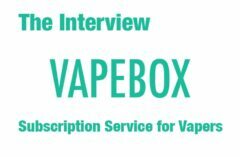 After I discovered vaping in 2009, I never turned back, and I wanted to be part of offering a product that could help others. SPINFUEL: Where are you located? More importantly, you sell online but is your brand currently carried in any retail shops? By the way, do you ship internationally? Immortal Fog is located in Bellingham, Washington. Our e-liquid is carried by electronic cigarette stores in the United States and the United Kingdom. You can see all of the retail locations at www.immortalfog.com. Also, we commonly ship to international locations around the world. SPINFUEL: How would you describe the IMMORTAL FOG e-Liquid flavor “signature”? We are unique in our approach to e-liquid creation, carefully crafting e-liquids in a way that accounts for potential changes in flavor preferences. Many people, for example, begin their vaping journeys with a tobacco e-liquid and, over time, switch to sweeter and more savory flavors. The staff at Immortal Fog created all seven flavors in a way that mirrors how vaping palates evolve over time. Whether you are new to vaping or an e-liquid connoisseur, we want to provide customers with e-liquids that they can use as their all-day vapes! SPINFUEL: Where do you do your mixing, bottling, and shipping? (photos would be a great idea, and will soon become mandatory for a Spinfuel Review). If you outsource the manufacturing, please state that you do. Immortal Fog produces its e-liquid in its state-of-the-art laboratory, located in Bellingham, Washington. SPINFUEL: Do you have a specific audience in mind for your eLiquids? Immortal Fog’s goal is to offer all adult smokers and alternative to traditional cigarettes. We know how hard it is to quit smoking cigarettes, and we are here to help customers along the way! Immortal Fog uses a variety of electronic cigarette devices when testing its e-liquids, including RDAs, sub-ohm tanks, and CE5 clearomizers. Our goal is to produce e-liquids that offer robust flavors regardless of the device used. SPINFUEL: Do you have a wholesale program? If you do, how do vendors contact you to inquire about selling your brand in their shop or website? Yes. Immortal Fog offers a wholesale program for retailers around the world, and we are happy to honor price match requests. Contact us at wholesale@immortalfog.com, and we’ll be happy to get you started! SPINFUEL: Have you attended many vape expos or conventions? Will you have a booth in any future events that we could tell our readers about? We made a big splash with the initial launch of our line at VCC in Tampa, Florida last March. We had a blast! It was a great opportunity to meet our customers face to face and establish ourselves as an up and coming e-liquid brand. It was really exciting to see people so enthusiastic about our juice! We plan to attend various vape expos around the companies in the coming months, and we will post our vape meet schedule soon. SPINFUEL: In your opinion, what makes a good all-day-vape eLiquid? The staff at Immortal Fog work hard to produce all-day vapes. We think that complexity helps define a good all-day vape. We produce e-liquids that you won’t get tired of after five minutes. We like flavors that keep us guessing, trying to figure out the mixture of flavors that produce amazing tastes. SPINFUEL: What types of eliquid regulations are you expecting this year? Are you ready for them? We expect that e-liquid regulations will continue to move slowly at the Federal level, and we do not foresee any drastic legislation that would affect the e-liquid industry, at least in 2016. We will, however, continue to see States passing new legislation focusing on youth prevention, in-store sampling of e-liquids, and labeling and packaging standards. SPINFUEL: Are you working on any new flavors right now? Do you have an idea on the ideal number of flavors for your brand, or is it a matter of being inspired to create a new flavor? We are always working to find the next new Flavor in the Fog! We recently launched a “limited release” flavor called Submergence. The flavor profile is Blue Raspberry with undertones of tart mixed berries. It has been flying off the shelves! We have since added Submergence to our permanent flavor line-up due to popular demand. In our opinion, there is no ideal number of flavors. We are having a great time experimenting with new flavor profiles as our vaping palates evolve. After months of research and development, we are close to releasing our next surprise flavor! We will continue offering unique flavors to the table that sets us apart from other e-liquid companies, and our meticulous research and development process ensures that our customers receive only high-quality e-liquids. We look forward to meeting as many of you as possible!